Raised on Alberta prairie farms, fresh Yorkshire Pork arrives in richly nourishing WholePrey ratios of meat, liver, kidney and cartilage that mirror the natural diet. Fresh whole butternut squash and pumpkin provide a rich source of soluble fiber to settle sensitive stomachs and support healthy digestion. Prepared from the best and freshest ingredients this Biologically Appropriate food is perfect for fussy or diet-sensitive dogs. ACANA benefits dogs of every variety. Just like you, your dog is unique with feeding requirements that vary with environment, age and activity. The table below provides a starting point, to be adjusted as needed to maintain optimum weight and peak conditioning. We suggest monitoring your dog’s weight and adjusting portions as needed. We recommend feeding twice daily and always keeping fresh, clean water available. 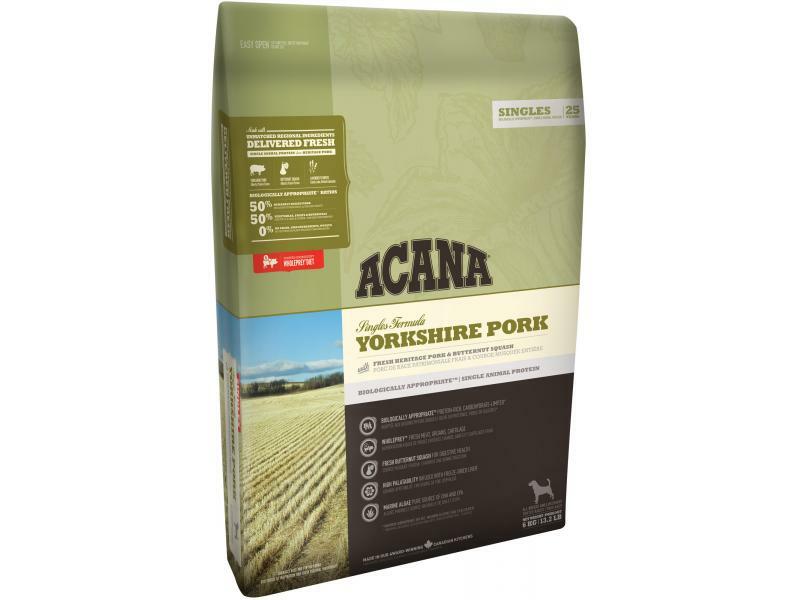 There are currently no questions for Acana Singles Yorkshire Pork Dog Food - be the first to ask one!